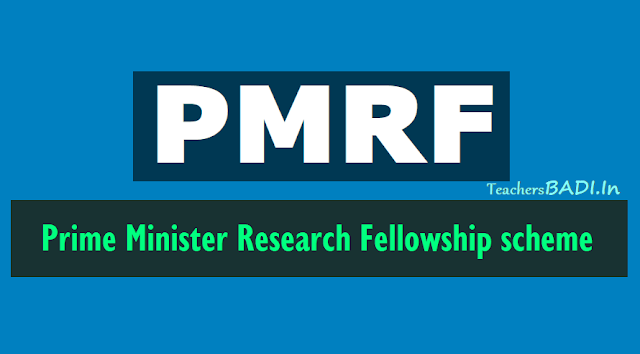 PMRF Prime Minister's Research Fellowship Scheme Web portal : www.pmrf.in. : The Prime Minister’s Research Fellowship (PMRF) scheme is aimed at attracting the talent pool of the country to doctoral (Ph.D.) programs of Indian Institutes of Technology (IITs) and Indian Institute of Science (IISc) for carrying out research in cutting edge science and technology domains, with focus on national priorities. Under the PMRF scheme, students who have completed, or are pursuing, the final year of four year undergraduate or five year integrated M.Tech or five year integrated M.Sc. or five year undergraduate-postgraduate dual degree programs in Science and Technology streams from IISc/IITs/NITs/IISERs and centrally funded IIITs are eligible for admission to full time Ph.D. programme in the IITs & IISc provided they fulfil prescribed eligibility criteria and finally get selected after shortlisting/written test/interview. For each participating IIT and IISc the Ph.D admissions under the PMRF scheme will be supernumerary. Applicants who fulfill the eligibility criteria, and are finally selected through a selection process, will be offered admission to Ph.D. program in one of IITs/IISc with a fellowship of Rs.70,000/- per month for the first two years, Rs.75,000/- per month for the 3rd year, and Rs.80,000/- per month in the 4th and 5th years. Apart from this, a research grant of Rs.2.00 lakh per year will be provided to each of the Fellows for a period of 5 years to cover their academic contingency expenses and for foreign/national travel expenses. The final year students (and those who are awarded degree in past five years) of four year undergraduate or five year integrated M.Tech. or integrated M.Sc. program from IISc /IITs /NITs /IISERs /centrally funded IIITs are eligible. B.Des. admitted through JEE/UCEED and 4-year BS or B.Sc students of IISc, IITs, or IISERs admitted through JEE, KVPY, and SCB are also eligible. Q. I completed my B.Tech. degree three years ago from an NIT/IIT. Am I eligible to apply for PMRF? Yes. Those who are awarded degree in past five years (i.e. graduated during or after 2014) are eligible to apply for PMRF 2018. Each application will be treated as a fresh application. Q. I am a final year student of BS program in an IISER. I joined my course through KVPY. Am I eligible for PMRF? A. Yes. The final year students (and those who are awarded degree in past five years) of four year undergraduate or five year integrated M.Tech. or integrated M.Sc. program from IISc/IITs/NITs/IISERs/centrally funded IIITs are eligible. B.Des. admitted through JEE/UCEED and 4-year BS or B.Sc students of IISc, IITs, or IISERs admitted through JEE, KVPY, and SCB are also eligible. Q. I completed my B.Tech. from a college not included in the list of qualifying institutes above and thereafter obtained M.Tech. form IIT. Am I eligible to apply? A. No. The qualifying degree (i.e., four year undergraduate or five year integrated M.Tech or five year integrated M.Sc. or five year undergraduate-postgraduate dual degree programs in Science and Technology streams) must be from IISc or an IIT/NIT/IISER or a centrally funded IIIT. Q. I am a dual degree student at an IIT. I have been awarded two separate CGPAs for my B.Tech. and M.Tech. degrees. Which CGPA will be considered as qualifier? A. The CGPA/ CPI of B.Tech. shall be considered as the eligibility criteria for the applicants with dual degrees (B.Tech. + M.Tech.) where two separate CGPA/CPI for B.Tech. and M.Tech. are provided. If a combined CGPA / CPI is given, then the combined CGPA will be considered. Q. My CGPA until seventh semester is 8.19, however, I have a backlog. Am I eligible to apply? Q. I am a final year student and have <8 CGPA until seventh semester. Should I be provisionally allowed to appear for the selection procedure subject to the condition that I might improve my CGPA at the end of my B.Tech? No. You will not be considered this year for the selection procedure. However, you may apply for the PMRF next year should you secure CGPA of 8 or more at the time of graduation. Q. I am a PhD scholar in an IIT/IISc. I graduated from NIT and joined IIT under the Direct PhD programme. Whether existing scholars like me who meet all the criteria, but have joined last year will be eligible to upgrade to PMRF? A. No. You will have to apply afresh and if selected and allocated the same institute where are you currently registered for Ph.D. program, you will be eligible for PMRF for the rest of the PhD tenure. For example, if you have availed MHRD fellowship for two years, you will be entitled for maximum three years of PMRF, total five years). Q. Which are the institutes where PMRF Fellows can join to undertake research work as a Ph.D. student? A. The institutes are the 23 IITs and IISc. Q. I have interests in two disciplines, chemistry and nanotechnology. Can I apply for more than one discipline? Yes. An applicant can apply for multiple disciplines. She / he will need to individually appear for multiple written tests and/or interviews conducted at the respective nodal institute. Q. Do I need to submit a project proposal along with my application? A. You must submit an abstract as described on the PMRF website. Q. Does PMRF scheme apply for part-time Ph.D.? A. No, PMRF is for undertaking full-time Ph.D. program at IITs/IISc. Q. Is there a word limit for the abstract? Can I upload the proposal in JPEG format? A.The word limit is 1000 and it must be in PDF format. No other format is acceptable. Q. What is expected from the project abstract? A. The requirement for a project abstract is aimed at assisting the selection committee to judge research and analytical capability of the applicant. The originality of the abstract is very important. The abstract will be checked for plagiarism. Q. Who can be the referees? A. The referees should be from among those with whom the applicant has closely interacted with during his undergraduate or post- graduate program and who can comment on the applicant’s academic knowledge and research and analytical skills. Q. How many times can I apply for fellowship under the PMRF scheme? A. You can apply two times provided all eligibility criteria are met each time. Q. If I am selected for fellowship under the PMRF scheme this year, but do not avail the offer, can I apply once again next year? A. No. However, you can defer your admission for one year subject to approval of the host institute. Q. Is the PMRF scheme the same as the CII-PMF scheme? A. No, they are different. Q. What will be the syllabus of the Written test? Q. Where will be the test centres located? A. A single written test and/or interview for each broad discipline will be conducted at the IIT or IISc which is the Nodal Institute for that broad discipline. Q. Will the written test/ interview of different streams be conducted on the same date. A. No. The tests will be conducted at different dates with a gap of a day or two so that an applicant may reach from one Nodal Institute to the other Nodal Institute. Q. Will there be any TA/DA provided for appearing for the test or interview? A. No TA/DA will be provided to applicant appearing for the written test or interview. Q. Will all the eligible applicants be called for the written test and/or interview? A. Not necessary. In case of a large number of applicants, only shortlisted applicants will be called for the written test and/or interview. Q. How will be the institute and discipline be allotted to the selected applicant if the applicant has selected for more than one institute? A. The applicant will be allotted a combination of institute and discipline as per the ranking order after the interview round. If an applicant is selected for more than one combination of discipline and institute, the combination will be allotted based on the preference indicated by the applicant in the application. Q. Can I give preference for different disciplines in an IIT/IISc? A. Yes. An applicant is asked to give preference in form of combinations (e.g. Chemistry at IISc, Biochemistry at IIT Bombay, Nanotechnology at IIT Delhi, etc.). Q. I have a specific idea for my potential research topic. Will the selection committee consider this while allocating me an institute/discipline if I am selected? A. The applicant may give her/his preference for the discipline/institute where the research of her/his specific interest is conducted. Q. Is there an application fee, and if yes how can I pay the application fee? A. Yes, there is an application fee of Rs 1000. The applicant should click on the fee payment link that will connect to SBI collect. The fee can be paid through various modes that include net banking, debit, and credit card etc. The applicant will need to enter the SBICollect Reference Number and upload the SBICollect e-receipt pdf file for the online application.